SEOUL, Oct. 19 (Yonhap) — K-pop girl group TWICE topped Japan’s Oricon Singles Chart with its latest single album, its agency said Thursday. 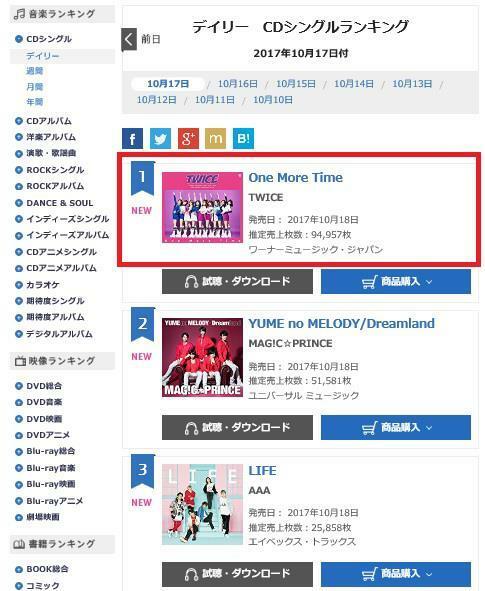 “One More Time,” released in Japan the previous day, took first place on the daily single chart of the key music sales tracker, according to JYP Entertainment. The album sold 94,957 copies there, comfortably beating the sales of 51,581 copies by Japanese group Magic Prince. The nine-member act, which includes Japanese and Taiwanese members, made its Japanese debut in June by releasing “#TWICE,” which holds its past hit songs both in Japanese and Korean. In August, the album was certified Platinum by the Recording Industry Association of Japan, an honor bestowed on records with sales of over 250,000 copies.